The successor of the X-E1 features a new EXR II processor and will cost around 1400 Euros along with an 18-55 mm f2.8-4 zoom. Almost identical to its predecessor design and resolution-wise, Fujifilm’s X-E2 is here merely one year after the release of its older sister. 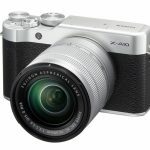 Like the X100S, full-frame cameras are the main competition of these new models (especially since Sony announced the A7 and A7R), and the new EXR II processor is key. Based on the official list of specs Fujifilm released, there doesn’t seem to be many differences between this and previous models, as it features the same APS-C 16-megapixel X-Trans sensor its predecessor has, as well as the 2.4-megapixel OLED electronic viewfinder. This new processor is supposedly capable of offering an impeccable image quality as well as the fastest automatic focus system on the market as of today. The shutter speed is also top-notch. Along with the new processor, the LMO system (lens modulation optimizer) the X100S features is also here to take full advantage of any lens (the camera is compatible with any X series lens from Fujifilm) and the sensor. Its 7 FPS burst mode (the X-E1 had a burst mode of 6 FPS) and an improved manual focus system are also two interesting new features. It features Wi-Fi connectivity as well and the 1-megapixel screen has gone from 2.8 to 3 inches. It will cost 1399 Dollars and comes with the 18-55 mm f2.8-4 zoom; the X-E2 is also capable or recording 1920 x 1080 video at 60 frames per second.